Given that the programs advocated by the billionaires cause severe harm to millions of students, the real question becomes how are the billionaires able to manipulate public opinion? How do they operate on the ground? 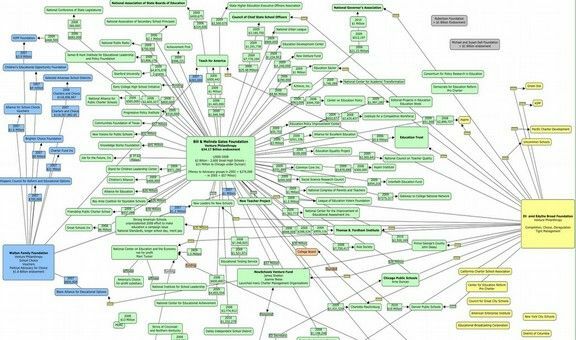 What are the tools and tactics they use to leverage their money to control public policy? Bill Gates controls more than $100 billion in wealth. By strategically deploying his immense wealth through financing fake scientific reports, and fake “Astro Turf” groups, Gates has been able to attack our public schools for over a decade. Previously, we noted that BillGates has spent billions of dollars to destroy and privatize our public schools. A huge part of his spending has been the creation of literally hundreds of fake grassroots groups with innocent sounding names like Students First and Parents for Better Schools. These groups often make donations to each other in order to hide the money laundering trail. 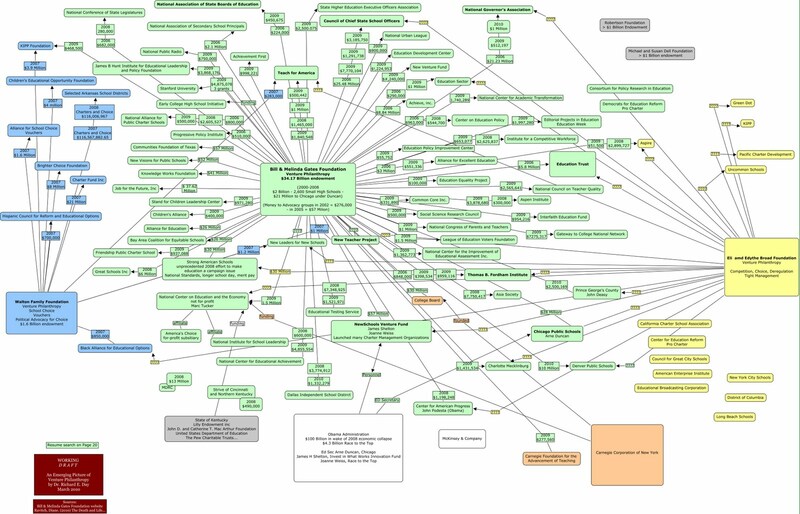 Below is a chart which attempts to show the interconnections between all of these groups. Go to the link below to see a bigger version of this complex image. While Bill Gates has set up hundreds of fake front groups (many shown in the above image), in this article, we will focus on just one of the most notorious and dishonest of these fake grassroots organizations, a group that calls itself Stand for Children (SFC), but should more accurately be called Stand for Billionaires – as it is just a deceptive mouthpiece for Bill Gates and other Billionaires in their drive to privatize schools and destroy teachers unions. 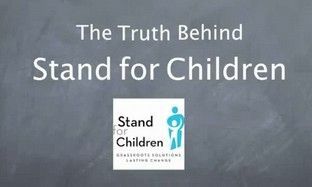 “Stand for Children” is a fake grassroots organization that acts as a front group for Bill Gates and other billionaires. But it was not always a front group for Bill Gates. When it was started in 1996, it actually was a real group focused on improving children's access to health care. 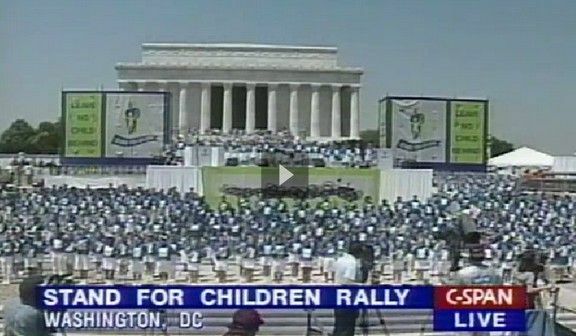 It was created after a rally for children in Washington DC on June 1 1996 organized by Marian Edelman, the head of the Children's Defense Fund and attended by more than 300,000 people. The motto of the Children's Defense Fund (CDF) is somewhat ominous. It is “Leave No Child Behind” a slogan later used by George Bush to punish children with endless high stakes tests. The Children's Defense Fund was started in 1973 by Marian Edelman. Also ominous is the fact that CDF is backed by wealthy corporations like CITI Group. Former First Lady Hillary Clinton was a former chair of CDF. According to Open Secrets (dot) org, the Children's Defense Fund has spent more than one million dollars on Congressional lobbyists. Their fund raisers seem to be more about helping the rich feel good about helping the poor while not actually doing anything to provide jobs and training for parents of poor children and housing and food for poor children. Meanwhile, the number and percent of poor children has skyrocketed in the past 30 years as the middle class has been destroyed by the billionaires who support CDF. After the 1996 rally in Washington DC, Marion's son Jonah Edelman started a new organization to help children called Stand for Children (SFC). Initially, the focus of SFC was to increase school funding. Their first chapter was in Portland Oregon. Stand was known for their blue tee shirts and organizing parents much like a local PTA. Since this initial grant, Gates has given STAND 9 grants totaling about $7 million - all to advocate for Common Core and High Stakes High Failure Rate tests. Stand for Children (SFC) is an organization that up until late 2007 represented the rights of children for things like adequate health care. However, after receiving millions of dollars in funding from Bill Gates and the Walton billionaires, it has changed into a monster that advocates increasing corporate tax breaks, reducing school funding, closing public schools, firing school teachers and replacing them with poorly trained TFA recruits and handing public schools over to private for profit charter school operators – which are also funded by Bill Gates and the Walton billionaires. Even worse, Stand acts as a funnel for billionaires to buy elections for corporate controlled candidates and corrupt politicians. Stand's standard operating procedure is to set up a branch office with professional recruiters who go into a community and spread money and lies around the community in order to deceive and recruit as many parents as possible in an attempt to get them on board as partners. Stand particularly likes to subvert and take over local Parent Teacher Association (PTA) organizations often by giving “jobs” (aka bribes) to local PTA and state wide PTA leaders. Stand then bribes public officials to pass union-busting legislation. The fake grassroots group that calls itself Stand for Children has spent massive amounts of money by corporate raiders to buy elections in Arizona, Louisiana, Colorado, California, Illinois, Indiana, Massachusetts, Oregon, Texas, Tennessee, Washington and several other states. The Bill & Melinda Gates Foundation began by offering Stand in Oregon a relatively modest two-year grant of $80,000 in 2005. In 2007, Gates gave Stand $682,565. In 2009, the point at which Stand’s drastically different political agenda became obvious, Gates gave Stand $971,280. In 2010, Gates gave Stand $3,476,300. That is $3.5 million in a single year! In Illinois, STANDspent more than $3 million in 2010hiring lobbyists, buying elections and bribing elected officials including Illinois Speaker Michael Madigan. Stand donated $610,000 to nine state campaigns in both major parties in Illinois in a single year. They worked closely with another Bill Gates backed group called “Advance Illinois” to elect Ed Reform candidates. Advance Illinois has received more than $3 million from the Gates Foundation. Gates also gave millions to several other pro-charter school groups in Illinois which also worked to elect the Ed Reform candidates. So while there appeared to be several different groups working on these elections, there was basically one source for all of the funds – Bill Gates. Much of the money was used for radio ads – none of which admitted that they were actually paid for by Bill Gates. A local community leader, Reverent Robin Hood, found the leader of SFC, Jonah Edelman and his group, Stand for Children, to be disrespectful and arrogant, with dollar signs and union-bashing on their mind. "I found they were anti-union when we met with Stand for Children...I knew they weren't focused on changing things for the children. They were union busting and making money off the backs of our kids... It was all about money, it was nothing about children. We need to educate our kids, not get rich folks richer. These are the same people that don't want you to have a living wage and adequate housing." Because of aware community leaders like Reverend Hood, at least some of the Stand backed candidates lost. For example, Stand and the billionaires gave $175,000-a record for Illinois- to Republican state House candidate Ryan Higgins, who lost his contest. So money does not always win if a community has informed leaders. Former Stand leader and current member of Parents Across America (PAA) Oregon, Susan Barrett wrote a ground-breaking post for PAA's blog in 2012, exposing the way a formerly real grass-roots group had been taken over by a fake grassroots group, Stand for Children with an agenda very different from the group's original purpose. Stand’s most significant work in Colorado was their support of Senate Bill 191, a landmark piece of legislation that bases 50 percent of a teacher’s evaluation on student achievement data. As Dana Goldstein explained in a recent American Prospect article, this may lead the state to test every student, in every grade, in every subject—including art, music, and PE. The poisonous debate around the bill vilified those in opposition and demoralized teachers across the state. Given that high stakes testing would have to expand from just a few grades and a few subjects to all grades and all subjects, some have estimated that this will result in a 20 fold increase in testing (and a 20 fold increase in corporate profits associated with designing and giving these high stakes tests). Stand also acted as a money laundering scheme to process campaign funds flowing from billionaires to Colorado school board races. For example, in the 2011 Denver School District school board race, three billionaire funded candidates ran as a “reform slate” for three seats on the seven member school board. Sadly, Colorado does not limit contributions to school board elections, so money from the billionaires poured in. According to the Colorado Campaign Finance Disclosure website, the reform slate took in $633,807 (an average of $211,269 per candidate). The billionaire funded candidates outspent their opponents by six to one. Just six donors accounted for $293,000. STAND gave the reform slate $88,511 in “non-monetary” contributions of staff support and canvassing services. Put in simple terms, Bill Gates hired a bunch of people to work for STAND. This group then worked to elect the three fake candidates to the Denver Colorado School Board. It was a way for Bill Gates to give money to these fake candidates without the public knowing he was giving money to these candidates. Even worse, the STAND paid staff appeared to the public to be volunteers when in fact they were paid to help elect the fake candidates. To further hide its involvement, STAND also created another fake non-profit group called “Great Schools for Great Kids” which used a super PAC with the same office as STAND. Two of the three billionaire backed candidates won, allowing the billionaires to maintain a four to three advantage on the Denver School Board. 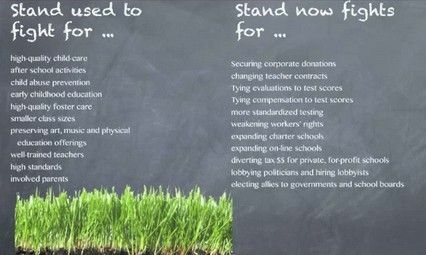 STAND has used a similar strategy to tip school board elections all over the nation. What studies have actually shown is that poverty is by far the biggest predictor (constrictor) of child development. Lower class sizes have been shown to help students overcome poverty. Teacher experience does play a role in child development with highly trained highly experienced teachers (those with 5 years of training and 5 years of experience) better able to help children build better internal motivation. However, since Stand advocates for replacing experienced teachers with TFA recruits having only 5 weeks of training and no experience at all, the policies promoted by Stand are not supported by any credible scientific evidence. The same thing happened in Massachusetts, where 39 former Stand for Children activists have posted against a SFC ballot measure that promotes a corporate reform agenda: "Venture capitalists and deep-pocketed corporate foundations, such as Bain Capital and the Walton Family Foundation, are moving aggressively to remake Massachusetts public schools based on their right-wing ideology. They are funding "Stand for Children" to sell a ballot initiative that would undermine our children's learning environment and sharply restrict teacher job protections. Don't let them do in Massachusetts what they did to Illinois!" “But in 2009, while we struggled to give voice to the needs of our schools, Stand’s staff was turning away from our concerns, announcing that it expected its members to forgo community advocacy in favor of a new, special agenda. “Immediately, Stand filed for a ballot initiative and used some of their new corporate money to hire people to collect the signatures. It cost them $3 a signature, but they have plenty more. They are following the master plan revealed in Colorado by their national CEO, Jonah Edelman, a month before it was announced in Massachusetts. The proposed ballot measure attempts to blow up the collaborative work that created the new regulations last spring. It does nothing to improve teaching in our schools. What it does is put the careers of our teachers at the mercy of an untested rating system, violating the recommendations of the people who designed that system. We fear the result would be to drive some of our best teachers away from the schools that need them most. This ballot measure fits the ideology of its corporate sponsors, but it is not what we want for those who teach our children. Most of all, it is not what we want for our children. 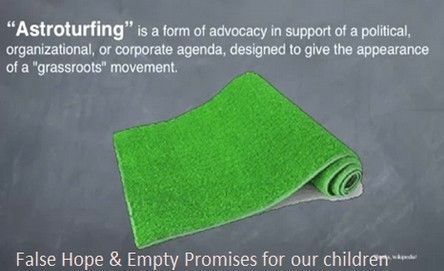 Stand for Children now stands for profits, not for schools and certainly not for children. In the next section, we will look at how Bill Gates has also taken over our corporate media which now works with fake groups like Stand for Children to control public opinion.